I arrived in Prague this afternoon [22 January 2019] on a Ryanair flight from Dublin and I am staying for a few days, until Friday morning, in the Grand Majestic Plaza, in the heart of historical and business centre of the Czech capital. The hotel, at Truhlarska 16, is in the Stare Mesto or Old Town, within walking distance of all the major historic and architectural attractions of Prague. The Old Town developed from the 11th century on, and the cobbled streets survive in many parts of the Old Town, which is a lively place, with cafés, restaurants, theatres and clubs. The hotel is just a few steps from Republic Square and the Municipal House, Prague’s most prominent Art Noveau building with its flamboyant and exciting decoration, including its glass dome. Here too are the Gothic Powder Gate and the Museum of Communism. The Old Town Square, Charles Bridge and Prague’s old Jewish Quarter are all within walking distance. The open-plan Atrium Restaurant with its Winter Garden and inner courtyard, serves Czech and international cuisine. I have only been through Prague airport, twice in 2005 and twice in 2007, on my way to and from Bucharest. Those were short stopovers, between an hour and three hours each time, with time for little more than a cup of coffee and little shopping. Every schoolboy in my generation learned in history classes about the Defenestration of Prague, without knowing what happened or the meaning of the term. In fact, there were two incidents in the history of Bohemia in which many people were defenestrated or thrown out the windows. The first was 600 years ago in 1419, and the second almost 200 years later in 1618, although the term ‘Defenestration of Prague’ more commonly refers to the second set of incidents. Each helped to signal or trigger a prolonged religious conflict: the Hussite Wars in Bohemia after the first defenestration, and the Thirty Years’ War after the second defenestration. 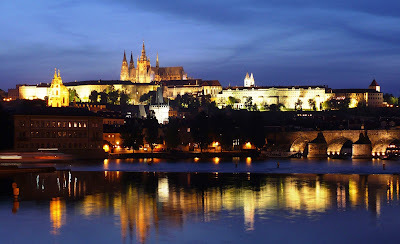 This week I plan to go on a full-day walking tour of Prague, to visit the castle, the cathedral, the squares, some of the churches and Charles Bridge, to walk through Josefov, the old Jewish quarter, and visit some of the synagogues and cemeteries, and to go to a concert. and I may even read a little of Franz Kafka, Milan Kundera or Václav Havel, look for the Golem of Prague, sing about Good King Wenceslas, or learn a little more about the Prague Spring and the Velvet Revolution … and all without engaging in any defenestration. Why not join me over the next few days as I explore the history and delights of this capital in the centre of Europe? It is easy to pay attention to the historical, commercial and ecclesiastical architecture of Wexford. The shops and premises on Main Street and the streets leading off it, such as the former Mechanics Institute, churches such as Saint Iberius, the Friary Church and Richard Pierce’s ‘Twin Churches,’ historic buildings from West Gate, Selskar Abbey and the town walls to Cromwell’s former House, Cornmarket and the YMCA, or modern buildings such as the new library, constantly attract the attention of photographers and architectural and local historians alike. But in the side streets off North and South Main Street, the domestic architecture of Wexford also has interesting stories to tell. In my early 20s, when I lived in Wexford in the mid-1970s, I was familiar with the Abbey Cinema on Upper George’s Street, and still remember the party atmosphere there when as a group of friends we attended a weekend late-night screening of Pink Floyd at Pompeii. The Abbey Cinema is long gone, and has been replaced by modern commercial and residential buildings. 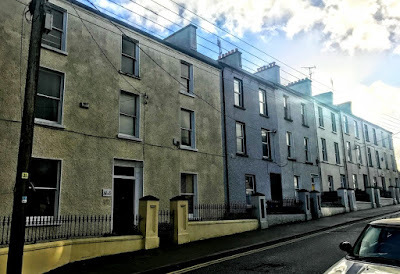 But across the street, on the other side of Upper George’s Street, an interesting terrace of grouped, late Victorian houses, provides an interesting example of the development of housing in Wexford in the 1880s. No 6-8 Upper George’s Street is an end-of-terrace, three-bay three-storey house, built in 1883, and now in use as offices. It is one of a terrace of four houses forming part of a group of seven. This well-composed, middle-size house was built by Mrs Mary O’Connor (1837-1927), who is an interesting example of a woman who was a property developer and building contractor at the end of the 19th century. She developed a number of other terraces of houses in Wexford, including Glena Terrace with eight houes on Spawell Road, in 1890-1895. She built her terraced houses on a site owned by the Bolton family of Island House as one of a terrace of four related houses that form part of a larger group of seven houses. They make a interesting and imaginative contribution to the streetscape of Upper George’s Street Upper with their rooflines corresponding with or following the slight incline or slope in the street. These houses have kept much of their unique character despite undergoing extensive redevelopment in the late 20th century, and they still have their early iron work and cast-iron embellishments. No 10 is a terraced, two-bay, three-storey house that is part of this terrace of four forming part of a group of seven. This is a well composed middle-size house that has been turned into apartments. It has been reasonably well maintained and retains much of its original features. No 12 is a two-bay three-storey house that is part of a terrace of four forming part of a group of seven. This is another well composed middle-size house built by Mary O’Connor. 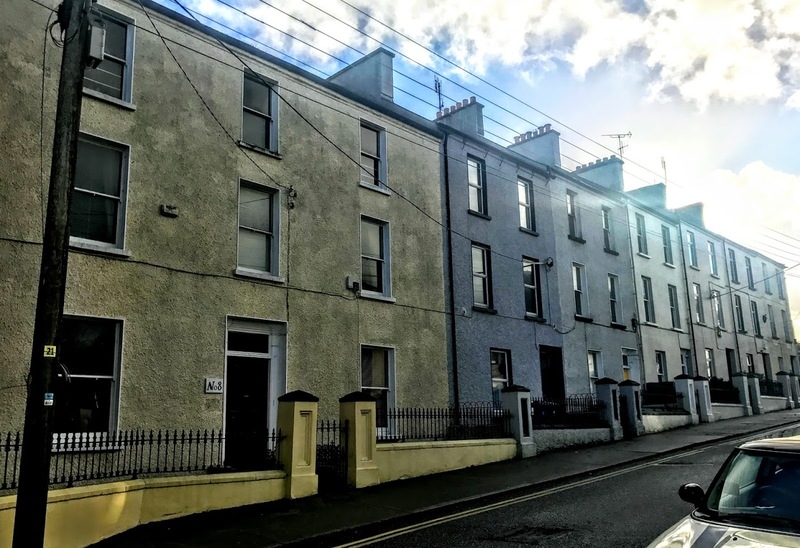 No 14 is a terraced two-bay three-storey house, built by Mary O’Connor in 1883, and is one of a terrace of four forming part of a group of seven. The square-headed door opening has a cut-granite step and a hollow timber panelled pilaster doorcase on cut-granite padstones, and the timber panelled door has an overlight. Inside, the windows still have timber panelled shutters. No 16 is a terraced, two-bay three-storey house, built in 1876 by Mary O’Connor. It is one of a terrace of three forming part of this group of seven, and is now in apartments. The square-headed door opening has a cut-granite step, there is a hollow timber panelled pilaster doorcase on cut-granite padstones, and the timber panelled door has overlight. Inside, some of the windows still have timber panelled reveals or shutters. No 18 is also a terraced, two-bay three-storey house, built by Mary O’Connor in 1876, when she was still in her 30s. This house, which is now divided into apartments, is one of a terrace of three forming part of this group of seven. Here too there is a square-headed door opening with a cut-granite step, a hollow timber panelled pilaster doorcase on cut-granite padstones, and a timber panelled door with overlight. Inside, some of the windows also retaining their timber panelled reveals or shutters. This group of houses, although it attracts little if any attention from visitors to Wexford, makes a positive contribution to the streetscape of Upper George’s Street and of Wexford town.